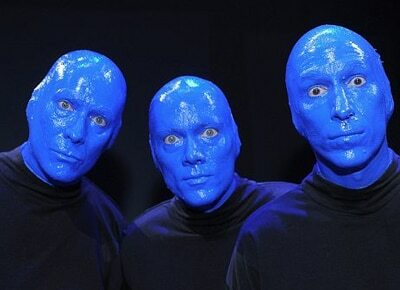 Blue Man Group performs for Pinoys for a limited run this month. It’s not often we see a trio of bald, blue aliens that resemble humans ready to entertain us on stage. But thankfully, the world famous Blue Man Group decided to make a stop in Manila as part of its 25th anniversary world tour. Described as a comedy, theatre, rock concert and dance party all rolled into one, the Blue Man Group first made waves as a hit in Las Vegas and during its off Broadway run. In an action-packed hour and a half show, expect this talented trio to redefine the usual Pinoy concept of entertainment with their unbelievable and impressive use of several pounds of Jell-O, PVC pipes, 30 liters of paint and (if you can believe it) 55 pieces of mashed up bananas. Currently performing at the Theater in Solaire, the Blue Man Group is completely non-verbal and visually stimulating which makes it easy for audiences of all ages to appreciate the show and be entertained. Having described themselves as "enemy of monotony, remedy for boredom, promoter of overjoy and elation,” the Blue Man Group lives up to that promise by taking the audience through a completely engaging experience involving live art, music, humor, dancing, and even a little audience participation here and there. The Blue Man Group immerses even the most passive audience member in a party atmosphere where nobody can possibly feel left out. Watch the Blue Man Group until September 25 at the Theater at Solaire resort and casino in Pasay city. This theater experience was brought to Manila by Concertus Manila, Globe Telecom, Lunchbox Productions and Blue Man Productions Ltd. Show is every 8 p.m, Tuesday-Friday; 2 and 8 p.m., Saturday-Sunday. For tickets call 8919999 or visit www.ticketworld.com.ph.